A scientist at the opening of FEYNMAN: THE CHALLENGER describes Richard P. Feynman: “He was physics with a human face”; able to transform the esoteric worlds of theoretical physics into lay speak. In other words, A Smart Guy for Dumb People. He was a roarer, a rogerer, a gorger and a puker. And a Nobel Prize winner for Physics in 1965. He was Dr. Richard Phillips Feynman (1918-1988), American physicist and bongo player. He was also a painter, a poet, a safe-cracker. He aided in the creation of the atomic bomb at Los Alamos. He hung out with strippers, thugs, beatniks and thieves. And professors. His life reads like Hunter S. Thompson – without the drugs and guns. I am overjoyed that this new documentary was made. 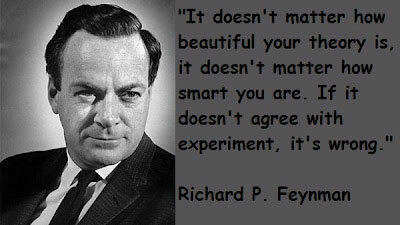 But Feynman has been dead for over 25 years! What kept you, assholes?! The truth is, FEYNMAN: THE CHALLENGER has been slapped together to coincide with the TV movie, THE CHALLENGER DISASTER (hence its appropriate name, for venal reasons). There are other, more detailed documentaries, such as RICHARD FEYNMAN: NO ORDINARY GENIUS. Now that’s a full-fledged documentary. Meanwhile, THE CHALLENGER (narrated by Bruce Greenwood) is here for our modern perusal, bare bones with space for ads, a précis of his achievements, with new interviews from old talking heads (General Donald Kutyna, Ralph Leighton, Freeman Dyson, Richard Davies, including his sister Joan, a physicist herself), and – the coolest parts – lots of interviews with Feynman himself. Many of his anecdotes related here seem to be lifted word for word from his riotous biographical bestseller, Surely You’re Joking, Mr. Feynman: Adventures of a Curious Character (1985), but we realize that it is the other way ’round – these are the interviews that went into making that book. The doc features footage of his first wife, the spectacular beauty, Arline, who died tragically of tuberculosis at 25, when Richard was just 27. He would marry his third wife, Gweneth, in 1960, and she would remain with him to his death in 1988. We also see the infamous “Feynman diagrams” that explained complex QED theories in pictograms – something which no one thought of doing before him. And of course, there is a segment on the 1986 Space Shuttle Challenger disaster, and Feynman’s integral role in highlighting the O-ring failure of the Solid Rocket Boosters that caused the explosion (to be clear: Feynman was fed information subtly, and as an outsider, could proclaim blame and fault without political liability within the close-minded, gutless, political walls of Washington). After four operations, Feynman succumbed to the liver cancer that plagued him for the last portions of his life, performing his last great deed – the Challenger inquiry – even whilst it ate at him. One of the best things that tells us everything about this eccentric, outgoing genius: from black and white shots, to his lectures, to his modern interviews, Richard Feynman never loses that cheeky look on his face! Starring: Richard Feynman, Bruce Greenwood, Donald Kutyna, Joan Feynman, Ralph Leighton, Freeman Dyson, Sean Carroll, Leonard Mlodinow, Richard Davies, Carl Feynman, Michelle Feynman, Jirayr Zorthian, Danny Hillis.